Port opened this match with their foot on the accelerator with Kevin Heenan cutting in from the right to send in a 25 yard volley which was handled well by Kirrie keeper Mark Anderson. Three minutes later and John Elliot fired in a 35 yard right foot drive which screamed over the keepers left hand upright. Port were looking in great spirit continuing to have most of the play when Gareth Daily collected the ball out on the left and cutting inside he was brought down within the area. J Ward stepped up to neatly slot the ball home for the opener. Twelve minute mark and some tricky play from Kevin Heenan down the right had him sending over a searching ball which floated over the danger area begging for a touch from a Port forward only to fall at the rear post to be sent upfield yet again. Port were in rampant mood picking up and building from the rear spreading from right to left with Daily and Heenan. 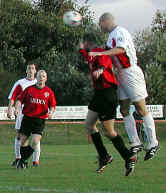 The gaffer sent Kevin Heenan to play down the middle which paid of minutes later after a corner from the right was again cleared by the Kirrie defence but this time it fell in the middle where Kevinn Heenan was waiting to hit home a driving right foot shot which rose high into the top right hand corner. Tayport continued to build and create some decent goal opportunities, 26 minute mark and another corner from the right was met by Derek Weymss who hit a powerful header scraping the crossbar heading for the tall fir trees. Kirrie broke upfield running inside from left to right straight for the Port goal area. Wardy spotted the danger and cut across to intercept the advancing danger and putting in a cracking sliding tackle to send the ball for Kirrie's first corner of the match. Port did have the ball in the net again only to be disallowed for what I'm not sure may have been offside. 42 minutes and a Ralph Hunter right foot drive was punched clear by keeper Anderson for yet another corner bringing to the end a great effort from the homeside which looked a like a huge improvment on the their previous form at the Canniepairt thus making the second half one to look forward to during the welcoming cup of tea. The gaffer brought on Sean Christie and B McNaughton for the second period with Kevin Heenan and Gareth Dailly getting deserved rests. Have you heard the saying pedal to the metal? well the start to the second half proved the opposite with Port lifting their foot from the peddle and letting Kirrie see much more of the ball during the opening 15 minutes of the period. Although never threatened Frazer Fitzpatrick found he had some gathering of the ball to do. Port started to settle after the second half changes to their formation grabbing control of the middle and on 64 minutes a through ball found Sean Christie running in from the left. Keeper Anderson spotted the danger and was quickly out to meet the advancing Christie diving bravely at the forwards feet. The ball sprung out to the keepers left falling to the the ever present Brain Craik who had followed his team mate looking for that final pass to slot the ball home for Ports third. Give Kirrie their due they were not for lying down and they quickly hit back with a lovely move down the middle which split the Port defence with a ball to substitute Callum Ray who ran straight at the Port goal finding Fitzpatrick advancing forward towards him. The Kirrie striker cooly slotted the ball past Fitzpatrick and followed it into the net to gather quickly and return it to the centre spot. Tayport were quickly back on the goal trail when on 72 minute Barry McNaughton found himself inside clear in the goal area to the left with keeper Anderson again diving bravely at the midfielders feet. Barry decided to try and take the ball around the diving keeper but the keeper managed to do enough for the ball to roll out of play for a goal kick. Yet again Brian Craik and this time Ralph Hunter were advancing in on goal looking for that tapping pass which could easily have been number four. 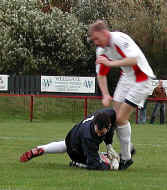 Port closed the match on 89 minutes with a Derek Wemyss rocket from 15 yards scraping the upright. Ben Honeyman came on in the closing stages for Brian Craik. Tayport F Fitzpatrick. G Paterson, J Ward, D Wemyss, B Craik, R Hunter, J Elliot, R Morris, G Dailly, R Gunnin, K Heenan. Subs used S Christie, B Honeyman B McNaughton.